If you are searching for a storage system that is flexible and durable, then file shelving in-a-box is perfect for you. These storage systems are modular, which means you can put them and move them around anywhere in your office. You can be flexible with your storage because file shelving in-a-box can move when and where you want it. Do you hate having to put together furniture? Well you won’t hate having to put together file shelving in-a-box because it’s boltless and is assembled completely with just a rubber mallet! Once you have the file shelving in-a-box assembled, you can adjust the steel shelves and file dividers to store not only files but binders, boxes, and any other supplies. Also, you can rest assured that whichever color you decided on out of the 19 standard colors will stay looking great because the high quality powder coat finish is scratch and corrosion resistant. One of the best features of file shelving in-a-box is that it can be personalized for your storage needs with additional accessories. Just call StoreMoreStore toll free at 1-855-786-7667 to add on the features you like best. Drawer Systems- Lockable media drawers with dividers on the file shelving in-a-box can accommodate the storage of CDs, DVDs, small parts, hardware, and more while providing you extra security for important files. Magazine Drawers- The door swings up and into the shelving unit, which provides easy access to the latest edition of a magazine that is stored up front or the previous editions that are stored neatly behind the door on the shelf. Garment Rod- These clothing storage rods are ideal for locker room or uniform storage and their strong construction provides durability. Pull Out Reference Shelf- Provides a space efficient work station for quick reference without sacrificing valuable floor space. 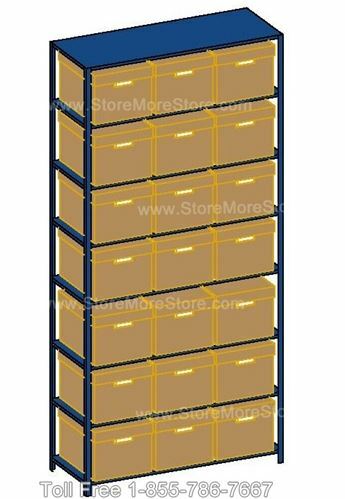 Shop Now for File Shelving In-A-Box! If you are ready to experience storage that will adapt to your needs and style, then visit StoreMoreStore or call us toll free at 1-855-786-7667 today to invest in file shelving in-a-box. At StoreMoreStore we do things differently. What does that mean? It means we design our file box shelving with the customer’s needs in mind. 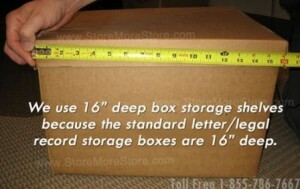 For example, most companies sell file box storage shelving that is 15 inches deep, but we make our shelves for storing record boxes 16 inches deep because that is the size of a standard file box! Also, we only use 30 inch and 42 inch wide shelving so your record boxes will fix perfectly in our storage shelving with no wasted space. Whether you need to store 12 record boxes, 500 record boxes, or anything in between, we have box storage shelves that will work for you. 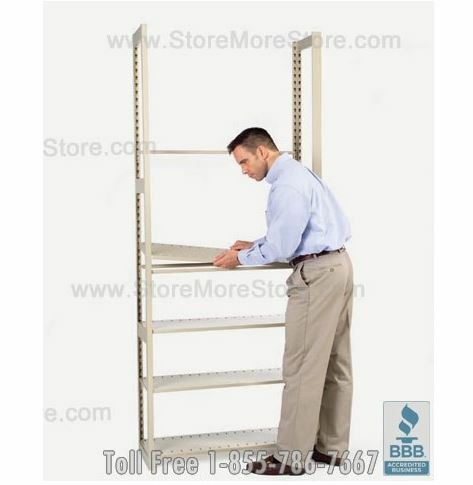 Shop online now at StoreMoreStore for file box storage shelving! 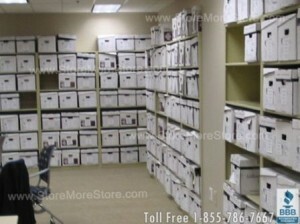 Right now we are offering a special discount for buying 2 or more shelves for storing record boxes. 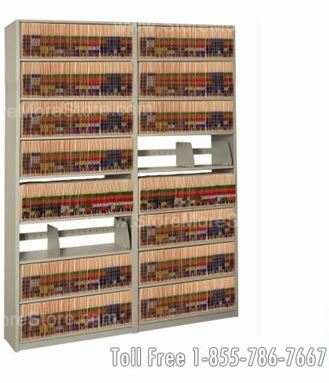 As always, if you can’t find the file box storage shelving you are looking for or you have any questions, feel free to give us a toll free call at 1-855-786-7667 or send us a message. 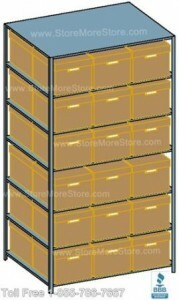 Check out our rolling double and triple deep file box storage shelving at StoreMoreStore. These record box shelves roll or slide back and forth on tracks to double or triple your box storage capacity to maximize your storage floor space, provide better organization, and make it much more convenient for employees to access boxes!